We present our Ring of Houses Real Estate PowerPoint Templates PPT Background for Slides 1112.Use our Real estate PowerPoint Templates because, illustrate your ideas one by one and demonstrate how each is an important cog in running the entire wheel. Use our Business PowerPoint Templates because, anticipate the doubts and questions in the minds of your colleagues and enlighten them with your inspired strategy to garner desired success. Use our Marketing PowerPoint Templates because, Focus on each one and investigate which one would be the best fit for your needs. Use our Success PowerPoint Templates because, develop your marketing strategy and communicate your enthusiasm and motivation to raise the bar. Use our Finance PowerPoint Templates because; Fill the hungry minds of your colleagues with the various goodies. Use these PowerPoint slides for presentations relating to "Ring of houses, real estate, business, marketing, success, finance". 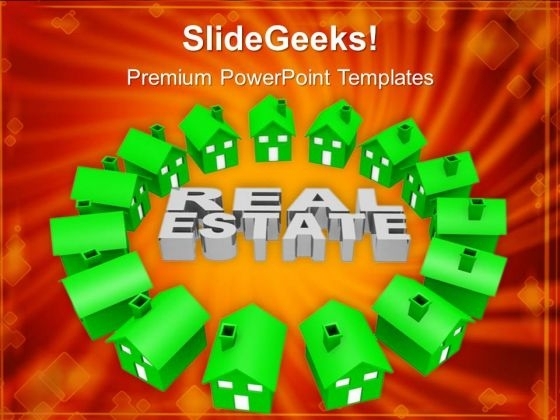 The prominent colors used in the PowerPoint template are Green, White, and Black Our Ring Of Houses Real Estate PowerPoint Templates Ppt Background For Slides 1112 will be your best buy. The value of your thoughts will definitely appreciate. Our Ring Of Houses Real Estate PowerPoint Templates Ppt Background For Slides 1112 believe in being consistent. The are designed to maintain a standard.